When managing pigs on pasture, Seven Sons Farm focuses on meeting the triple bottom line of health of the land, business and community. See how they achieve these goals. 1. Does this decision benefit the long-term environmental health of our land? 2. Does this decision benefit the long-term health of our business? 3. Does this decision benefit the long-term health of our community? If the answer is no to any of the above questions, then we go back to the drawing board. In the context of holistic management this series of tenets is referred to as the “triple bottom line.” It’s the belief that the whole is always greater than the sum of its parts. In order to hold to these 3 tenets, this means our daily management decisions must be responsive and adaptive. In the videos below you will learn how we’re using adaptive grazing with our hogs to accomplish our stewardship tenants described above. Example 1: Using hogs to encourage nutrient cycling. During the winter we keep our hogs in fields close to the farmstead where we have frost free watering points and huts for shelter. Over the course of the winter, these areas become loaded with high amounts of nitrogen and nutrients from the dense distribution of manure. In the spring we move the hogs away from these wintering areas and then we seed specific plants that are ideal for metabolizing the high amounts of nitrogen. In the video below we planted non-gmo corn that grew over 6 feet tall with no fertilizer inputs needed. We then turned the hogs back into this area to forage and eat the new growth. Most of the plant matter will be returned to the land to feed the soil microbes, resulting in increased organic matter year after year. Notice that we’ve met all 3 tenants: the soil is improving in health, our business is better off financially from increased soil fertility, and we’re producing healthy pork from healthy hogs for our community of customers. Example 2: Using hogs to encourage plant diversity in perennial pastures. In this video below we have a perennial pasture stand that has a high amount of Fescue and lacks some needed plant diversity. We’re allowing the hogs to disturb the soil in an attempt to awaken the latent seed bank. The soil disturbance also gives us the opportunity to seed new plants without having to mechanically till the soil. Not to mention the hogs are applying some great manure fertilizer at the same time. Just another example of using adaptive grazing to fulfill our 3 tenets of good stewardship. Hope you enjoyed the videos and learning more about our farm. If you have any questions, thoughts or improvements we could make, please reach out in the comments below. Blaine has spent his life working on the family farm. During high school Blaine pursued an interest in multimedia design and marketing. Blaine's interest in marketing served as an integral part of helping his family develop a direct marketing business. Today Blaine is employed full time at Seven Sons and is responsible for overseeing daily marketing and distribution activities. Blaine enjoys sharing the Seven Sons story by speaking to consumer and producer groups and has offered consulting to numerous direct marketers and has written for grazing publications. 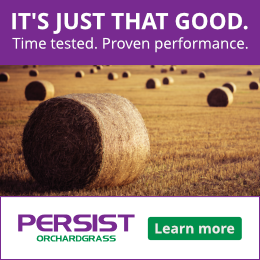 I think this is a fairly good way to use some of those nutrients from winter feeding, but there is one issue…In Wisconsin we are on a phosphorous standard for nutrient management planning, which is a requirement for all livestock producers. Phosphorous will build up in that area, since you are bringing feed in during the winter, and recycling during the summer as pigs eat the annuals. Over time, you will have excessive levels of phosphorous. While I don’t see nutrient runoff as a potential problem with your system, but the phosphorous buildup is an issue as it is wasting that nutrient to have it build up in one area past what the plants need to grow–remember that phosphorous is mined, and there is a limited supply on our planet. Some experts suggest we are at peak levels of phosphorous already, and if that is the case, we need to make better use of it. Your system is far better than others where crops are grown in tilled soil, year after year, where soil erosion and nutrient runoff becomes a big issue, and causes dead zones and algae blooms in lakes. I am just saying that the buildup of phosphorous is one area that is inefficient in your system and you guys are too smart to ignore that. I know you will figure out a way to deal with it. I am dealing with this too, as of this winter I am overwintering hogs for the first time. I have always tried to be conscientious about our cattle manure, by overwintering cattle in different paddocks where they can eat snow for water, or wintering them in a confined area, with a bedded pack, and spreading manure back on hay ground. With pigs, we are buying in feed, which means buying in nutrients, including phosphorous, so now I need a new plan. I invested in Idaho pigs, which supposedly will do just fine on hay alone, albeit slower growing, so that we can feed them from hay we produce, to avoid bringing in nutrients–our soil is not deficient in P, as it is a former dairy farm. I plan to grow corn, and other annuals on their wintering area, but also plan to move their wintering area. That means access to water is needed. I haven’t solved that one yet.